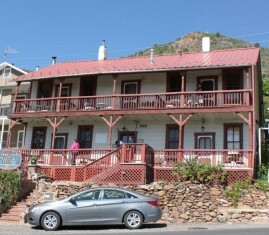 Roam to Jerome Arizona for the Fun of it! 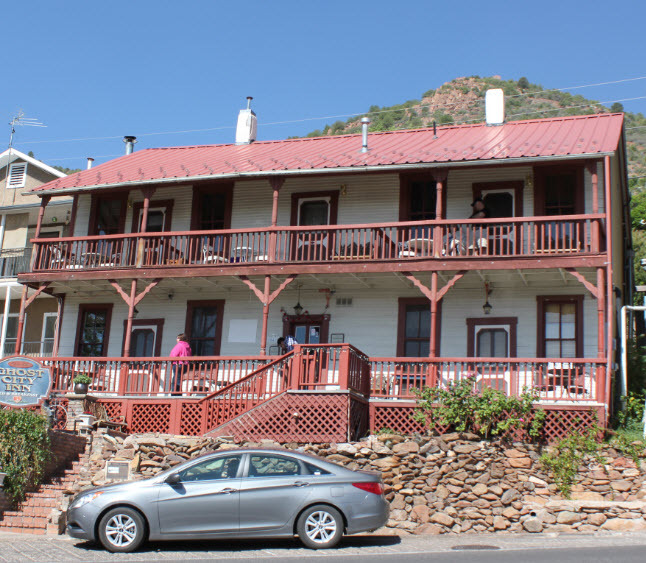 Across the valley from Sedona, nestled mile high in the Cleopatra mountains of the Black Hills of Arizona is the artist’s haven, Jerome Arizona. Once the site of the largest copper mining operation in the World, Jerome is re-surging as an artist colony and ‘The most haunted ghost town’ in America. With less than 500 permanent residents there is plenty of room for both. As you would expect in a mountain town, the roads twist and turn, switch back and then back again. Slow down and enjoy the view. The Verde Valley spreads out below, with a verdant river running through it. And keep a look out for unique houses perched precariously on the hillside. Some of the oldest homes and buildings are more than 100 years old. Most of the older houses have an incredible history complete with ghost stories. Park in any of the many public parking areas and walk up and down the streets. There are at least 3 wineries to check out, and a good handfull of restaurants to choose from. 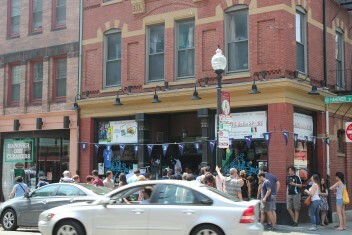 Be sure to check out The Haunted Hamburger for a huge burger and ghost photos taken during the recent renovation. Ask about the hammers. Make time to meander through the various shops and art galleries. Some artists live and work in Jerome, others live in the Verde Valley and have galleries in Jerome and Sedona. One artist we met was V. Norton, she works in multiple mediums and is very passionate. Ask her about her “Spirit Seekers” masks. Be sure to take a ghost tour one evening. Richard at Ghost City Tours was very knowledgeable about the town’s history and a great guide. And since all the bed and breakfast inns, including Ghost City Inn, and the Connor Hotel are said to be haunted, you just might have an ethereal experience of your own! Williamsburg Historic Triangle is a “Trip” to the Past. There is no doubt that there is more to do in the Williamsburg area than one can do in a week. 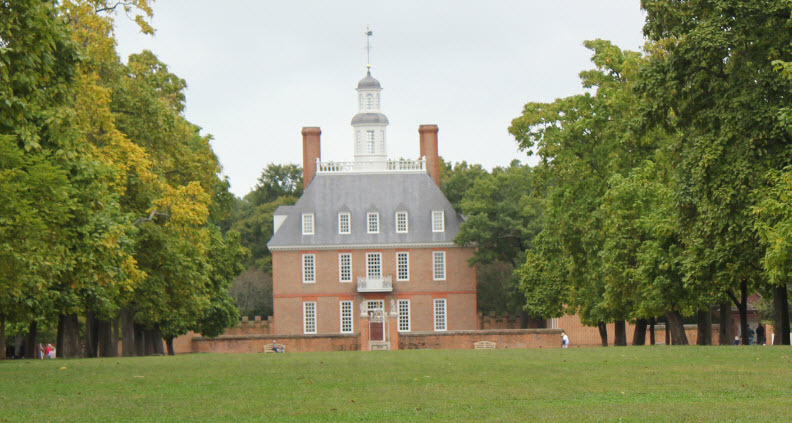 With Jamestown, Yorktown, and Williamsburg all within a few miles of each other, these 3 locations alone will take you at least 7 day to explore. If you are a history buff, or in to living history then you will have a blast in the historic Williamsburg triangle. 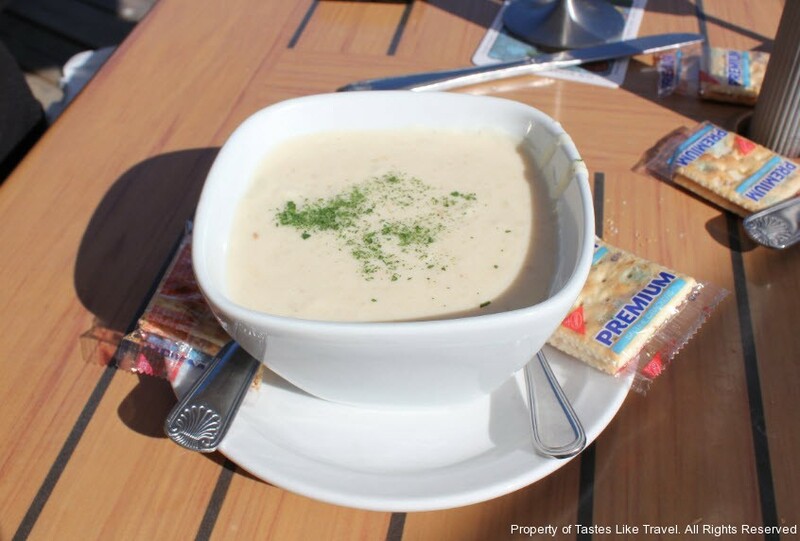 There are several ways to visit the “Historic Triangle”, but Tastes Like Travel recommends you visit Jamestown first, Yorktown second and then Williamburg last. The reason is simple. Jamestown was first. the English landed here in 1607 and established the first Colony that became the birthplace of America. Yorktown, on the other hand, is the place that America defeated the British to end the Revolutionary War. Both of these places are historic hallowed ground and a must see place. Visiting in this order give you information and insight that you will use as you visit the other locations. Williamsburg is a true living history location. 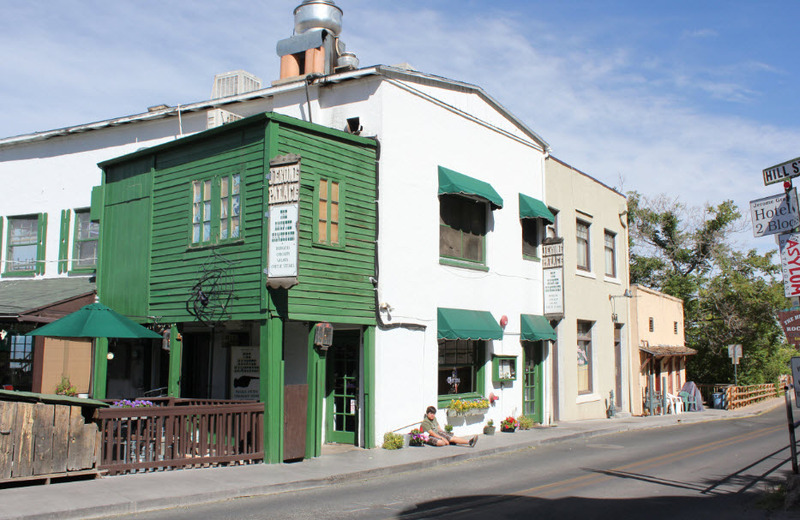 Essentially reconstructed by John D. Rockefeller II in the 1930’s, this town has been preserving and reenacting history since that time. There are hundreds of buildings to see, most recreating a shop, craft, or tavern that actually existed in 18th century Virginia. Some of the more notable are the Governors Palace, the Courthouse, the Armory and many others. When you arrive make sure you pick up “This Week in Williamsburg” as it will let you know what events and live reenactments are happening on each day. Each event is based on history and historical characters such as Patrick Henry, Benedict Arnold, Thomas Jefferson, and others all expertly played by character actors who never break character. On a visit to Mr. Charlton’s Coffee House we were thoroughly entertained by this character (see image) who was knowledgeable, informative and funny. The amazing thing is he never broke character. When told we were from the future he suggested a visit to the apothecary shop to get some hemp. Stating that Benjamin Franklin not only drank hemp as tea but also enjoyed smoking it….then ask if we might be doing that as well. It was a delightful encounter with an 18th century Williamsburg citizen that will not be forgotten. 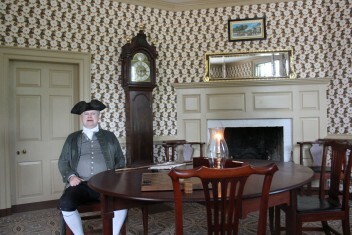 There are many events that take place during the day that draw characters from all over Colonial Williamsburg where they interact with each other and with the visitors. This is a fantastic historical representation of the actual events and people of Colonial Williamsburg that is sure to entertain and educate both young and old alike. A visit to the Williamsburg Historical Triangle is a wonderful experience. Tastes Like Travel considers this a must do experience for people of all ages. If you go, go before school is out, or after it has started in the Fall as it is less crowded and the weather is usually quite pleasant. Regardless of when you go, wear comfortable shoes and plan on spending several days in the Williamsburg Historic Triangle. There is literally more to see and do than you will have time for, but do not miss a chance to go. The experience is unforgettable. Boston is a vibrant city with plenty of history, culture and food to explore when you travel there. If you have been to Boston you know this. If this is your first time there are a few things you should know before you go. Getting around Boston is fairly easy and there are several options. Rental cars in Boston. Rental car rates vary from reasonable to expensive. Summertime rates are higher and if you shop around several times before you depart you can find some deals, even if you have already booked a car. The real expense is parking. Parking in Boston is very expensive. 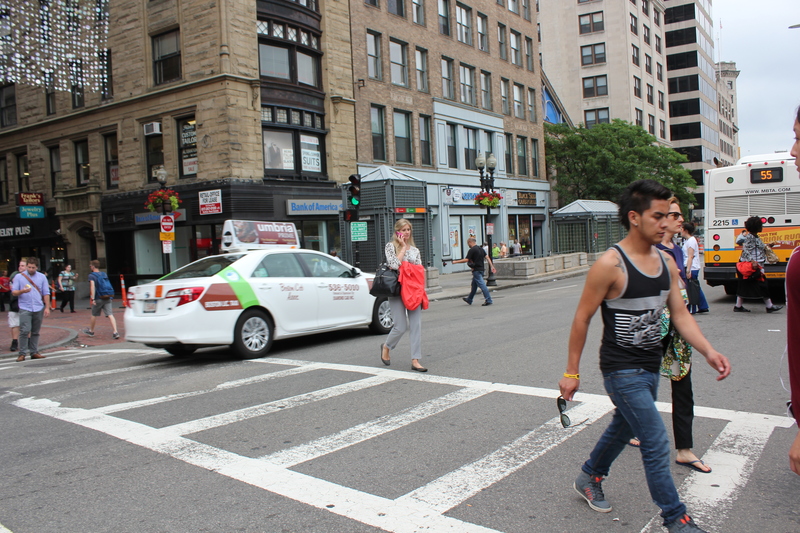 Most Boston natives take public transportation so parking lots are few and far between. Most hotels charge $35.00 to $48.00 per night to park. If you take your car out you will have to pay to park every place you stop. And we didn’t see a single gas station in downtown Boston. If you are sightseeing this can get expensive quickly. Rental cars will cost you several hundred dollars on top of the rental rate. Therefore Rental cars are not recommended. Taxi Cabs. Taxis are usually affordable. Since Boston is a condensed city most trips are less than $20.00. I took several cab rides and all but 1 were reasonable. Here is a tip though. Never take a cab ride when the cabbie tells you the cost before you go. Always demand a metered ride. Upon arriving at Boston Logan I need a ride to the hotel. The cabbie said it would be $35.00. Not knowing I agreed. The same metered ride to the airport when I left was $18.00. Quite a difference. It is OK to ask the cabbie what he thinks it will cost, but always use a metered cab ride. All of the cabbies I rode with were nice and friendly. Other than being over-charged on the first one, all of my rides were safe and enjoyable. Boston Metropolitan Transit Authority, (BMTA) or the “T”. The BMTA consist of trains, buses, and ferry’s. The good news is that $19.00 gets you unlimited rides on all 3 for a week. It takes some getting used to but it is well worth the price. Single rides run anywhere from $2.00 to $5.00 so you will easily save money by buying a pass. The BMTA website has some great tools to help you get to your destination. This tool tells you what transportation to take to get to your destination, where to change, and when to start in order to get you at your destination at the time you want. There are some downsides. The system is crowded between 7 and 9 AM and between 5 and 6:30 PM. The subways are crowded, hot in the summer, and there is a good chance you will be standing in the trains packed like sardines. If you can avoid these hours you can expect easy trips. Weekend schedules are different than weekdays, and although less crowded you may be waiting at a bus stop longer. One of our buses failed to show up at all one day and we walked……a long way. You can easily get confused on where you are, if you are going outbound or inbound and if the lines ( called green, red, orange and silver) will get you to your destination. Fortunately there are people in almost every station that will help you buy your ticket and get you going in the right direction. Again, overall it is worth the price. Then there is walking. You will wind up walking some in Boston. The Freedom Trail alone has some parts that you are better off walking. There are some obstacles though. Some of the streets are hilly, some are still cobblestone, and some sidewalks are narrow, all making it a little difficult. One other problem is that Boston is not bathroom friendly at all. There are limited public restrooms and most shops and restaurants have signs stating “No Public Restrooms” or “Restrooms for Customers Only”. There are a few in the subways that you can access without paying for a ticket, and the Monuments and National Parks have bathrooms as well. I was uncomfortable a few times. Just be aware my prostate brothers. If you get lost, I found that the native Bostonians were friendly and more than happy to help out. Some sensed my confusion and offered to help without being asked. A very nice man named “Kevin” went out of his way to point us in the right direction. and gave great restaurant suggestions! Don’t be afraid to ask a native. I recommend using a combination of taxis and public transportation. It is the most economical way to see Boston and truly an experience you won’t soon forget. Northeast of Phoenix about 40 miles one will find the Town of Wickenburg. During the winter months this town is alive with snowbirds seeking the warm winter sun of Arizona. Tastes Like Travel took a day trip in the area, and in the quest for a some good food, we found ourselves at the Gold Nugget Restaurant. 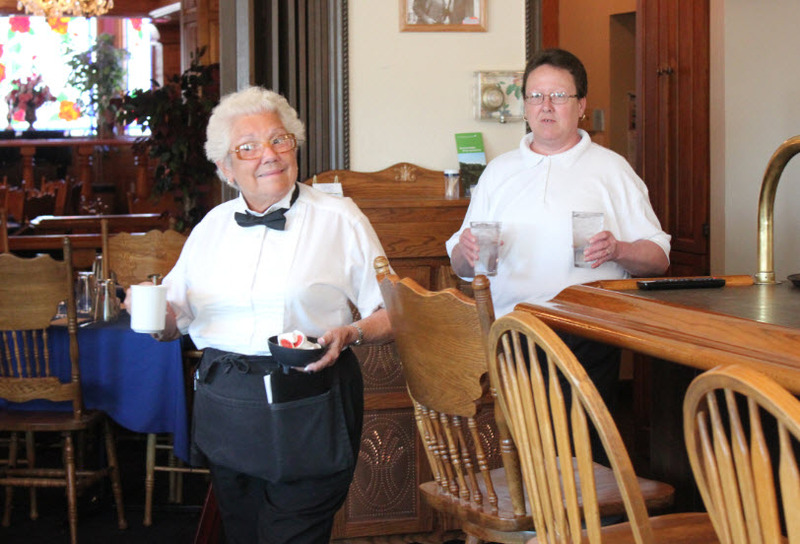 As soon as we walked into the Gold Nugget we were greeted by Donna and Betty, two friendly and warm women, who gladly saw after our every need. The restaurant menu contained a wide variety of food but, as always, we asked Donna and Betty their recommendations. 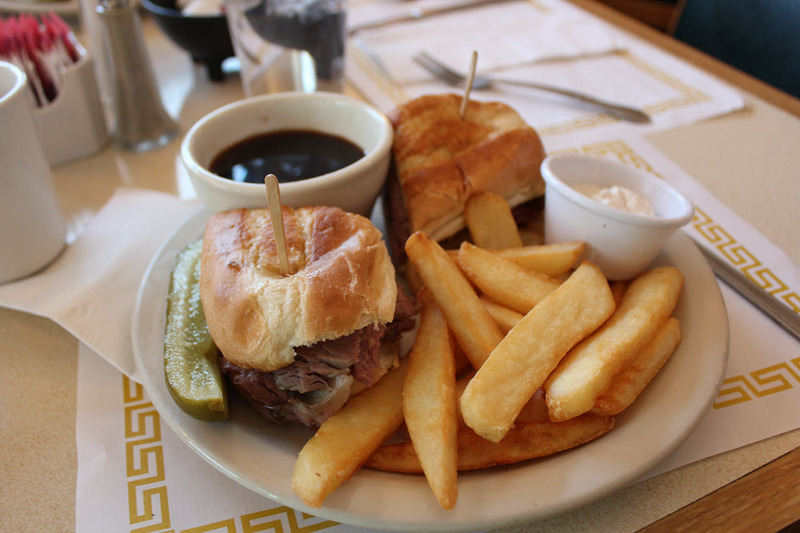 Without hesitation they said the Prime Rib sandwich and the Ruben were among the best. We agreed to try one of each, and while we waited for our food to arrive, we chatted with Betty about the restaurant. As we talked the lights flickered and Betty said, “That is the Ghost“! It was time to explore the Restaurant. The restaurant was very large and had several rooms. As we walked into a large dining room( I rattled the haunted light to see if the bulb was loose……… it was not) there we plaques over many of the tables. 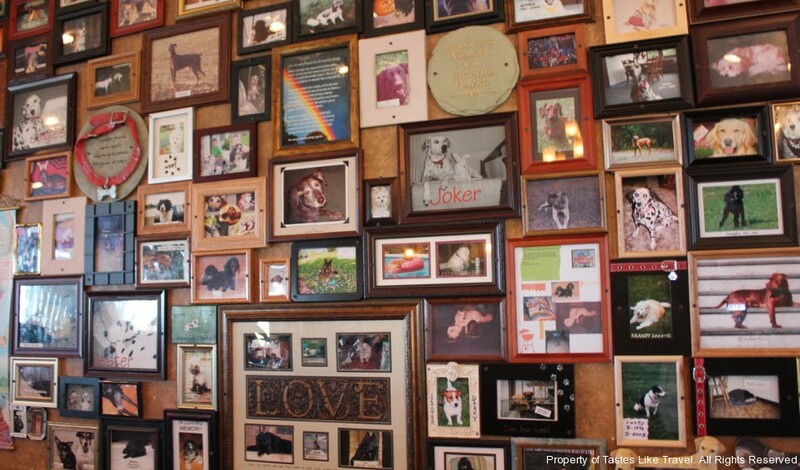 These plaques noted the table of choice of many famous people including John Wayne, Clark Gable, local boy Val Kilmer, and dozens of others who have and do frequent the restaurant. Not surprising given the history of this place. It was worth a look around. Donna appeared with our food and we focused on the feast. I had the Prime Rib sandwich, medium rare with Au Jus, and the better half had the Ruben. My sandwich was one of the best I have ever had. Fresh, juicy and augmented by awesome steak fries. The better half was equally impressed with the Ruben but she raved about the Cole Slaw. Based on our meal the Gold Nugget Restaurant has fresh and tasty food served with a smile. If you are ever in Wickenburg make sure you go to the Gold Nugget Restaurant. You will get a great meal, a history lesson, service you rarely get these days, and have a good time while you are there. Make sure you ask Betty and Donna how they came to Wickenburg, that is a whole blog by itself. 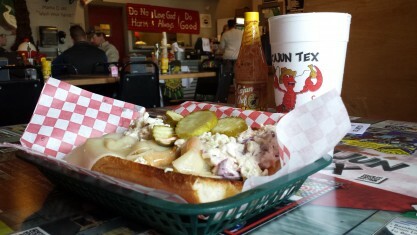 On a recent trip to East Texas I stopped in to the Cajun Tex restaurant for a quick lunch. Located on Grand Avenue in downtown Marshall, This restaurant had a varied menu with a blend of Cajun and Texas foods. The lunch special of the day was a Cajun pork chop served with veggies. Although this was tempting I opted to go with one of the house specials, The Big Easy. This Po Boy included grilled shrimp with melted provolone, pickles, cole slaw and tartar sauce. The sandwich was huge and the was no chance to eat it without the use of a fork. 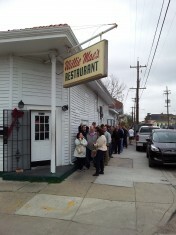 The Po boy was very good and had plenty of shrimp. If you go I would highly recommend this sandwich. There are several items on the menu that are house specialties. These items have a little red crawfish by them. I look forward to trying all of them. When I walked in I was greeted by the friendly staff and my order was taken immediate. All orders are placed with the cashier so there is no waitstaff, at least at lunch. I am not sure if this is true for dinner. I was given a number and within a few minutes my order arrived. The inside, and outside were tastefully done in a mix of Cajun and Texas decor that kept me looking around until my food came. Each table had a placard pointing out a decoration and gave its history. Since it was close to Mardi Gras there was additional decor celebrating this event. There were several locals, always a good sign of food, in the restaurant even past the noon hour. 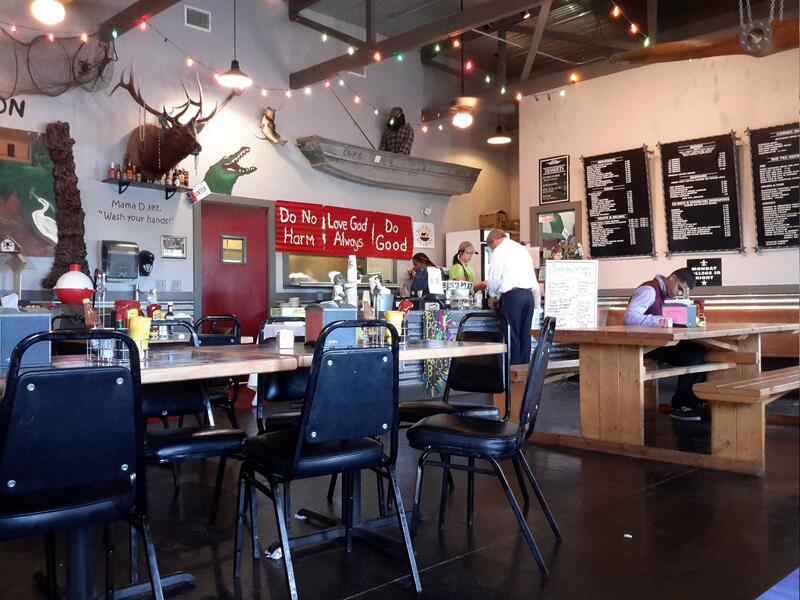 If you are in Marshall sometime, stop in to Cajun Texas and experience some of this great food for yourself. I don’t think you will be disappointed. I look forward to eating here again. The Big Easy Sandwich was outstanding. I was acknowledged and my order was taken quickly. 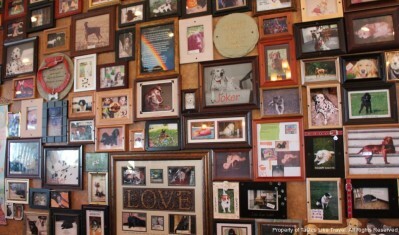 The Cajun Texas Decor was great. Once in a lifetime an opportunity presents itself that is impossible to pass up. Recently Tastes Like Travel had the opportunity to travel to Samson Cay Exuma in the Bahamas and live aboard an 80′ Pershing for 3 nights. Samson Cay is just north of the more popular and touristy Staniel Cay. During those 3 glorious days we went fishing every day. 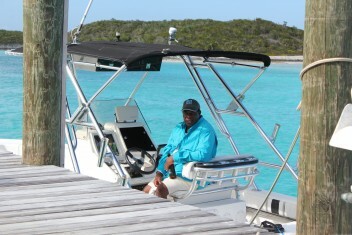 Our fishing guide was Cliff Smith, better known as Bonefish Cliff of Staniel Cay Divers. We Arrived on a Thursday afternoon and Cliff arrived a few minutes later. We boarded his center console fishing boat and headed to the deep water east of the more popular and touristy Staniel Cay. Within 15 minutes we had our rigged Ballyhoo trolling behind the boat anticipating action. Cliff began searching the sky looking for birds. He spotted a Frigate bird and announced that the bird would lead us to fish. We closed in on the bird. 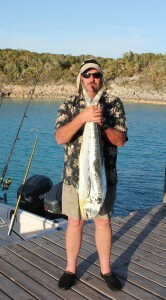 We did not have to wait long before we hooked up with a Mahi-mahi. There is nothing better that catching a Mahi-mahi. It is a great fight and an even better meal. We Landed 2 pretty quickly and then searched for more. We trolled some more when we spotted a school of Mahi-mahi and turned into them. We hooked up immediately. Cliff instructed us to keep a hooked up fish in the water and the school would stay around. Within a minute or 2 we all were hooked up. It was truly a fun fishing experience. For the next 2 days we caught more Mahi-mahi and went fishing the shallow water on the west side of Staniel Cay and caught plenty of yellow snapper, groupers and mangrove snapper. Cliff put up on good spots every time and obviously had incredible knowledge of the area and what fish to expect. He also took us snorkeling in some of The Exumas more beautiful places. Cliff, or Cliffie as we liked to call him, Is truly a great fishing guide. He also is experienced in snorkeling excursions, scuba diving trips, and he can catch you some spiny lobsters, or let you catch them if you wish. Cliff owns Staniel Key Divers. He truly is the go to guide of the Exumas. Staniel key is accessible by air. Take a flight to Ft. Lauderdale and then catch a flight to Staniel Key. If you go tell Cliffie Tastes Like Travel said Hey Mon! 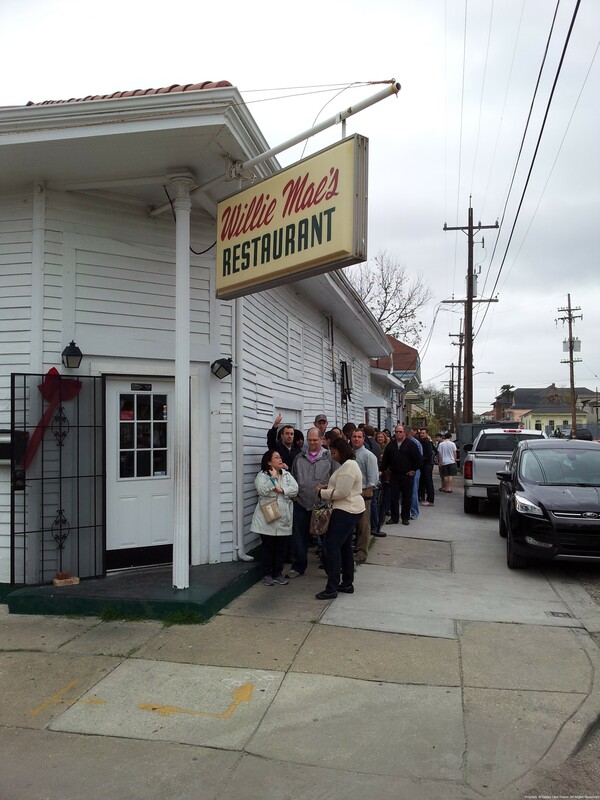 Willie Mae’s Scotch House New Orleans, Americas Best Fried Chicken?